A new idea for the world of classical illumination. Realized in forged iron with glass top, the Dream table lamp combines the concept of lighting with furniture, and is born to be used as table lamp or desk, with a decorative and fascinating design, that brings MM Lampadari towards a contemporary style. 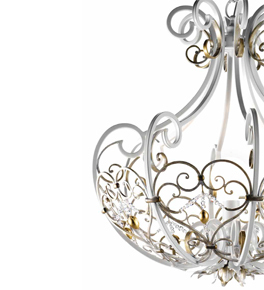 This collection includes chandeliers, floor or table lights and wall lights.